After seeing so many recipes for blood oranges this winter, I finally decided to bite the bullet and make one. I went to the store and bought what I thought were blood oranges, but when I sliced them open, they were regular oranges. Rats! Instead of scrapping the recipe test, I went forward with the plain oranges. I haven’t tried roasting blood oranges yet, but if they’re anything like regular oranges, I want to! What an unbelievable flavor transformation. Discoveries like these are what excite me so much about cooking – you never know what something’s going to taste like until it hits your tongue. It’s true – foods can dramatically change flavor or shape, just from cooking them a certain way, at a certain temperature. It’s like when you’re a little kid and you get your first Easy Bake Oven. You put this little gooey concoction in a plastic tray, put it through a machine, and out the other end comes a big fluffy treat! I really miss my Easy Bake Oven. I hope they’re still around when I have kids one day. No rush there, just sayin’. Also, I love roasting foods because the flavors and smells become so intense. When you bake something as simple as broccoli or brussel sprouts, your kitchen fills up with this robust aroma. 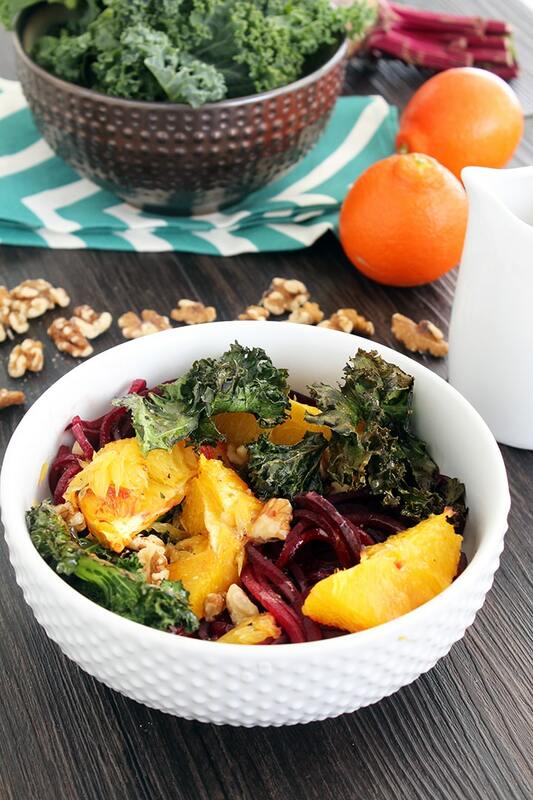 As for this dish, we get three roasted veggies here: kale, beets and oranges. While I was making this recipe (and tasting), I jotted down a few notes on my notebook: coconut, velvet and rich. Now, would you ever expect those words to be associated with oranges? I bet not! The outsides of the orange soften and become like velvet. The flavors melt in your mouth and almost taste coconut-like, which is the richness of the citrus baking. It really was the greatest surprise. I Instagrammed about it. Let’s not forget the crunchiness and saltiness of the kale. The trick with making kale chips is to use a minimal amount of salt or only salt when they come right out of the oven. To top everything off, we have honey roasted walnuts, which give the recipe a last bit of sweetness and also heartiness. 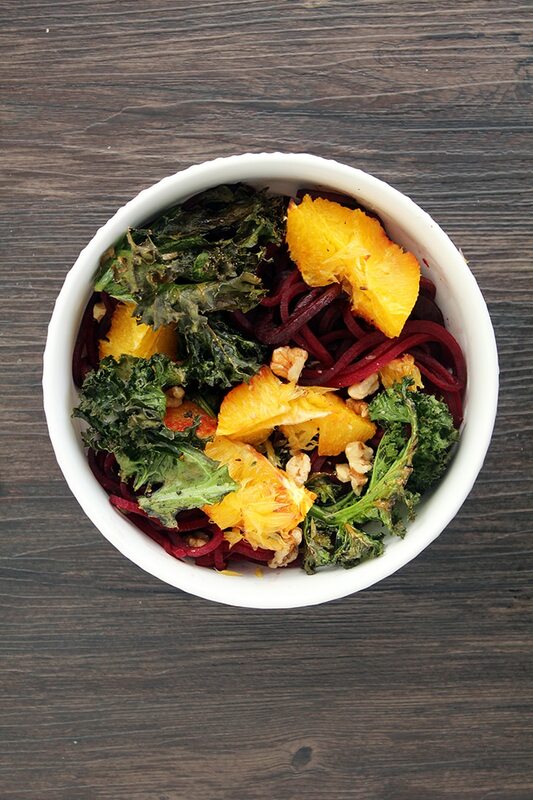 The citrus vinaigrette brings out the flavors in the beet noodles and the oranges. Winter blood oranges, I haven’t forgotten about you. I’m coming for you! Have you ever tried baking oranges? Preheat the oven to 375 degrees. In a baking tray lightly coated with cooking spray, place in the orange slices on one side and the kale on the other. Lightly coat the kale with the cooking spray and season with pepper. Set the timer for 20 minutes. After 10-12 minutes, remove the kale from the baking tray and set aside. Place the baking tray with the oranges back into the oven. 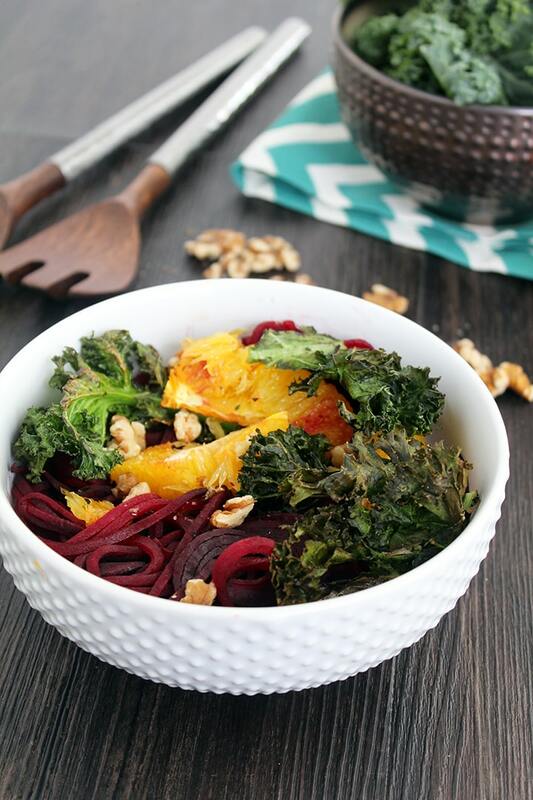 In another baking tray, place the beet noodles and drizzle lightly with olive oil. Season with salt and pepper and roast in the oven for 10-15 minutes. While the oranges and beets are roasting, assemble your vinaigrette. Place all ingredients into a bowl and whisk together. Place in the refrigerator. 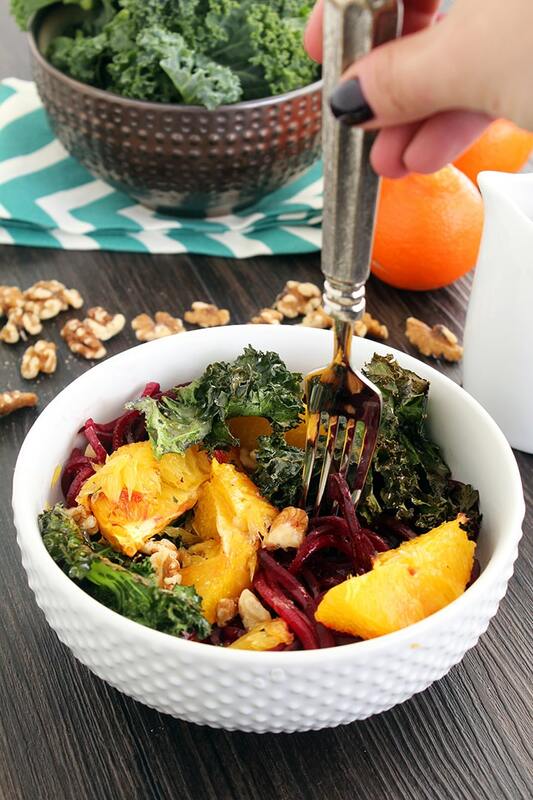 5 minutes before the oranges are done, place the walnuts on the side of the baking tray that used to hold the kale. Drizzle lightly with honey and toss carefully with tongs. Let roast for the remaining 5 minutes and take out with the oranges. 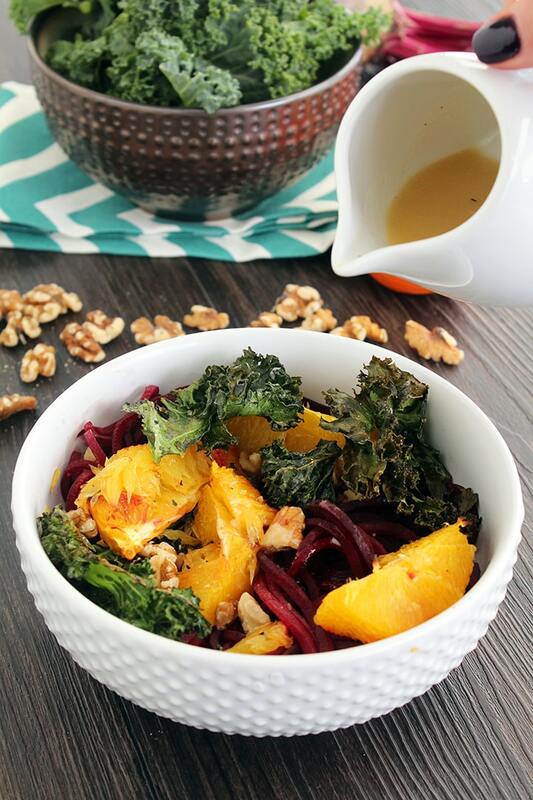 When the beet noodles are done (should be done with the oranges or have another 5 minutes left), place them in a bowl and top with the orange slices, walnuts and kale. Drizzle the vinaigrette over. Enjoy! Aghh! 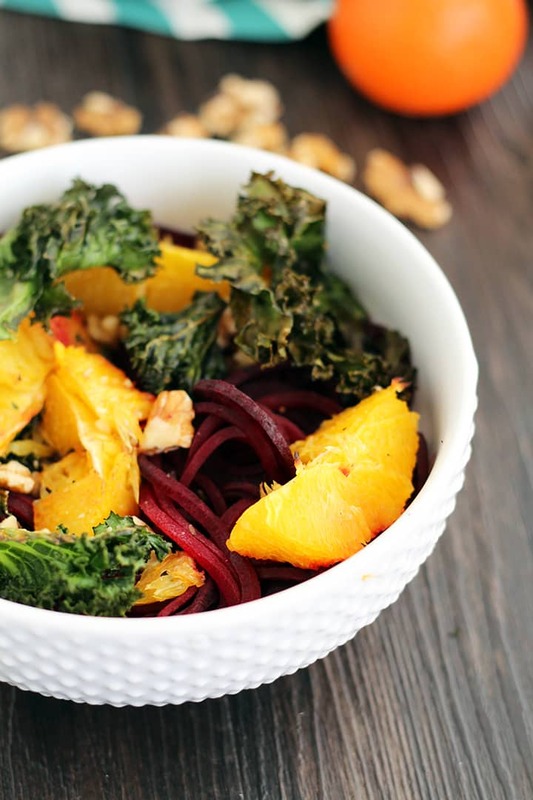 Look at those beautiful beet noodles. Love it! Wonderful Ali! I do wanna try this even more now! I love the use of blood oranges. I recently cooked with them for the first time, and I love them! Bring a beautiful color too....along with your gorgeous beets! I just need to get a darn spirializer! Think I can use my julienne peeler? I think that would be GORGEOUS! And yummy. Such a gorgeous meal, Ali! I love it! One question, recipes says drizzle walnuts with olive oil, is that supposed to say honey? This looks delicious! Yes, I just made the change! Thank you so much for catching it! 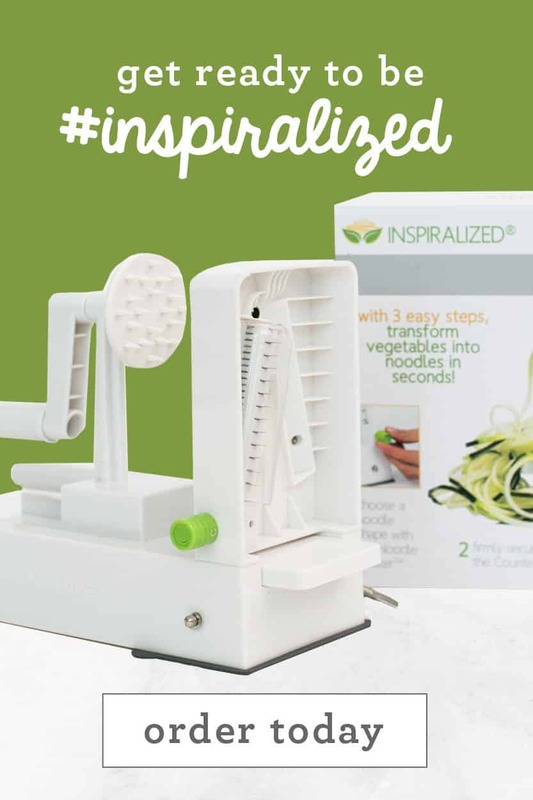 I am certainly getting a spiralizer! I found your blog a few weeks ago & i am totally intrigued! 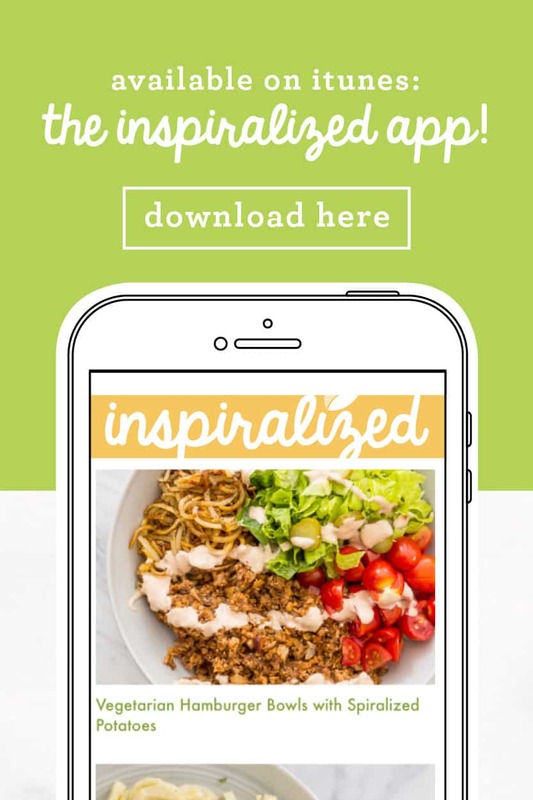 Your recipes look amazingly deliscious! 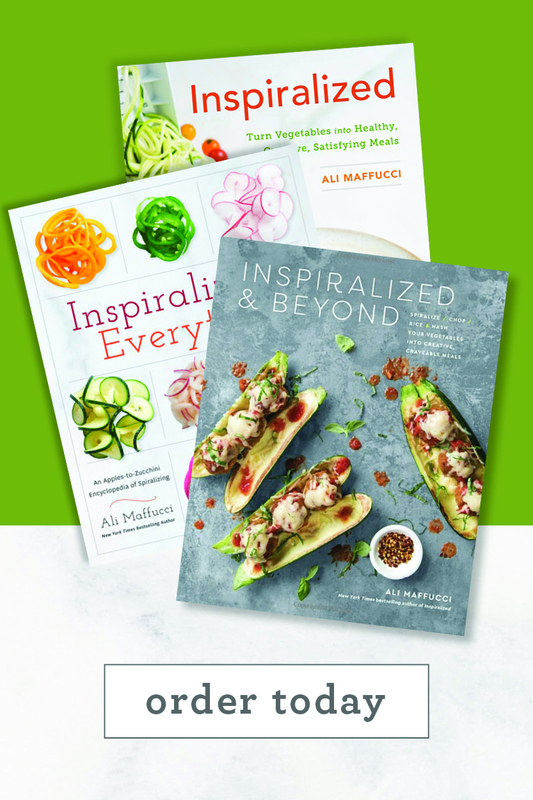 I will be starting a diet soon & your recipes will definitely fit right in & be a huge help. Thank you so much for the added inspiration & motovation. I can't wait to tell you of my progress. 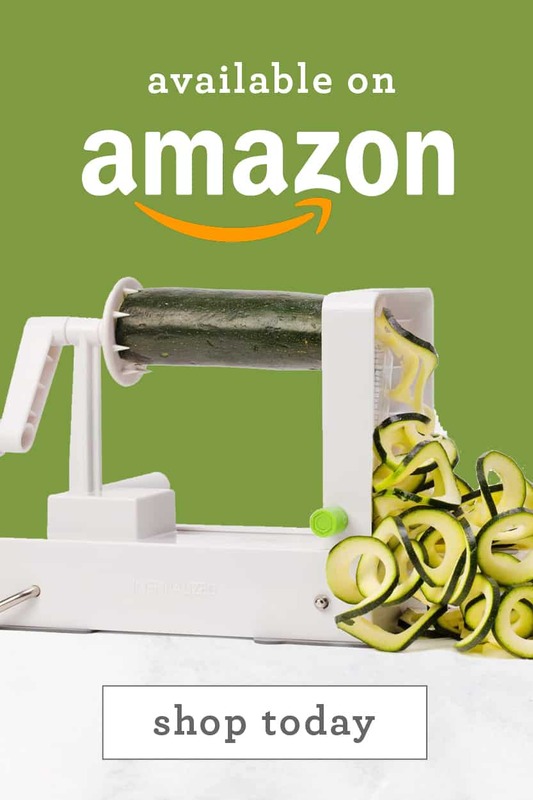 Also, i feel like i have found such a hidden treasure with your spiralizing veggies & recipes that i will certainly be sharing your blog & ideas to my coworkers. I work at a hospital & i encounter tons of people wanting to get healthier. Your ideas are the perfect start. Keep doing what your doing. You have a new fan!! I get so giddy waiting to see what you've come up with everyday. Thank you for your hardwork! This looks gorgeous Nd so delicious! Can't wait to try. 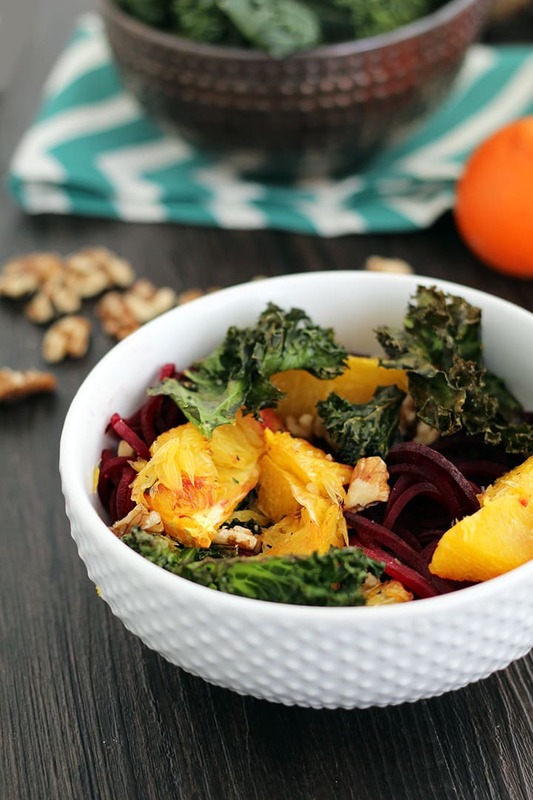 I LOVE Beets and Kale and can't wait to try this recipe! And I have not yet spiralized beets for beet noodles - can they be eaten raw or do they need to be cooked? Here, they are cooked. Just checking. Thanks, love the blog, great ideas. 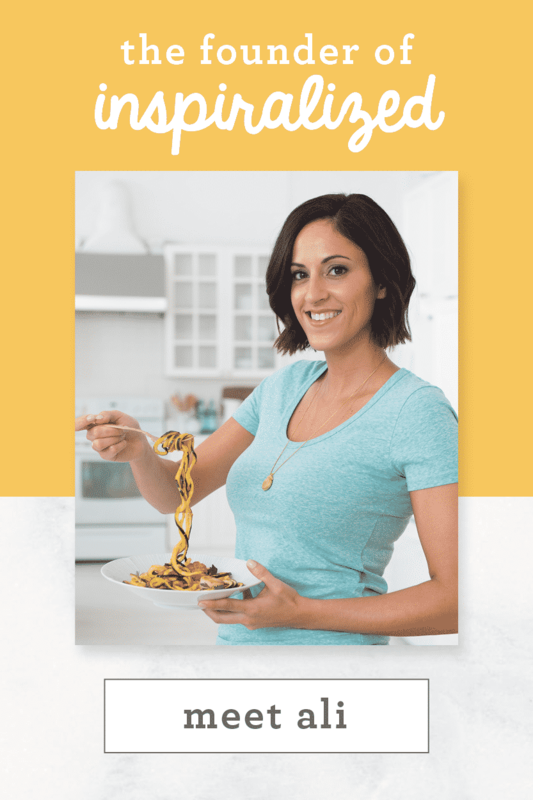 Yes, you can eat the noodles raw! 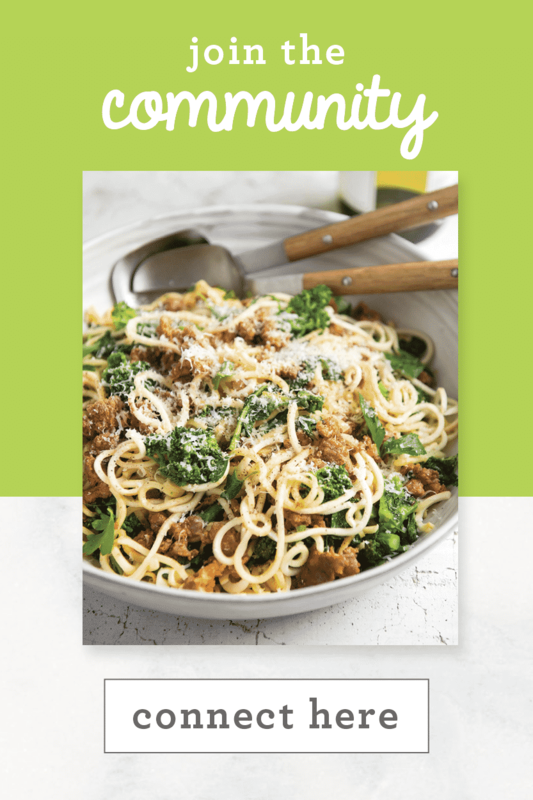 I am making this for the 3rd time tonight. My family loves it. 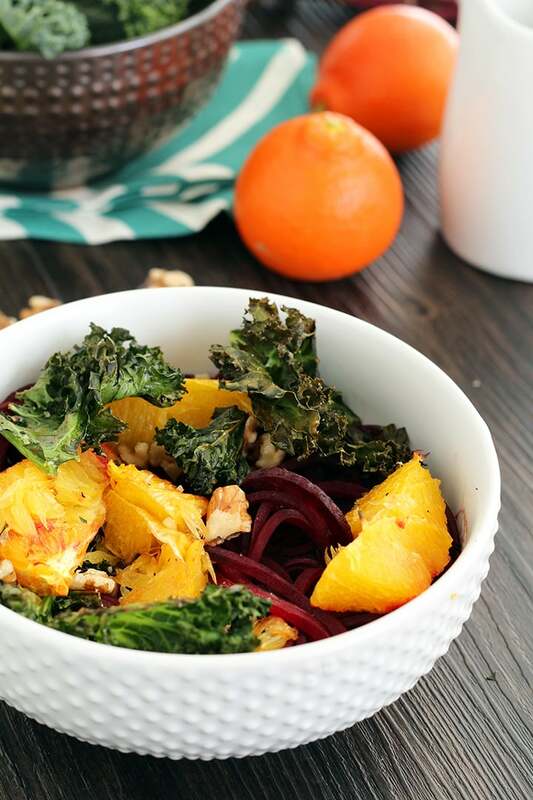 The combination of spiralized beets + oranges + kale + oven + dressing is amazing. 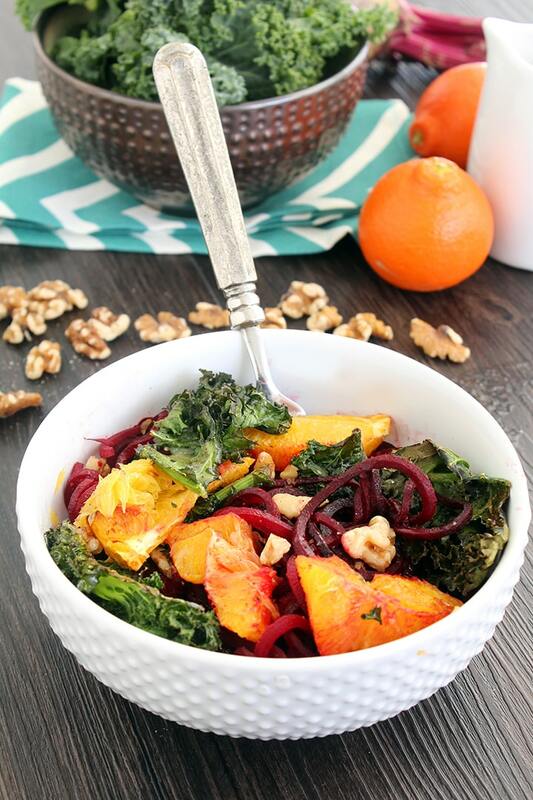 I actually crave this dish...and to think I didn't used to like beets! Separate your bulleted lists please. Add honey to the vinaigrette. Cook the almonds on the stove instead of baking with honey in the oven. I'd like to make this salad for a pitch-in. Could it be made a day ahead? maybe add the kale when I get to the pitch-in with the rest of the salad already combined? Yes for sure! Would just add the dressing last minute!